In our previous notebooks, we used a deep learning technique called convolution neural network (CNN) to classify text and images. A CNN is an example of a discriminative model, which creates a decision boundary to classify a given input signal (data) as either being in or out of a classification, such as email spam. In general, generative models can be used on any form of data to learn the underlying distribution, generate new data, and augment existing data. In this tutorial, we are going to build generative models through generative adversarial networks (GANs) to generate a new image from existing images. Our code will use Apache MXNet’s Gluon API. Let's see the power of generative models using a trivial example. The following depicts the heights of 10 humans and Martians. The heights of human beings follow a normal distribution, showing up as a bell-shaped curve on the a graph (see Figure 1). Martians tend to be much taller than humans, but also have a normal distribution. So, let's input the heights of humans and Martians into both discriminative and generative models. Figure 1. Graph of sample human and Martian heights. Image by Manu Jeevan. If we train a discriminative model, it will just plot a decision boundary (see Figure 2). 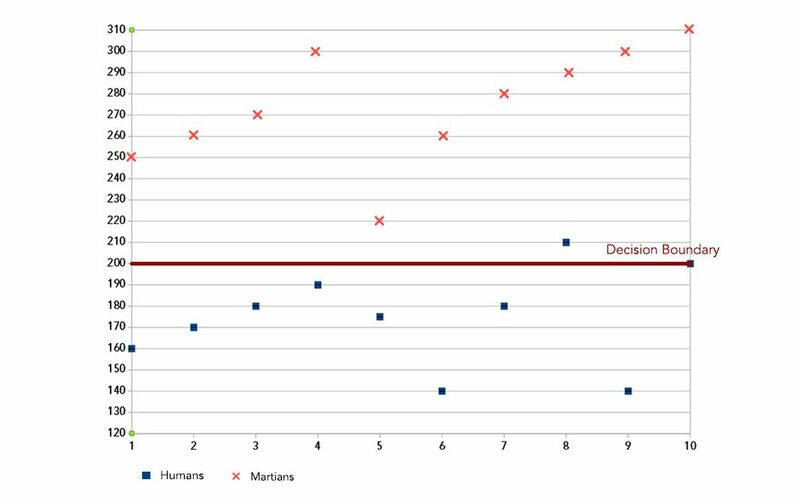 The model misclassifies just one human—the accuracy is quite good overall. But the model doesn't learn about the underlying distribution of data, so it is not suitable for building the powerful applications listed in the beginning of this article. Figure 2. Boundary between humans and Martians, as found by a discriminative model. Image by Manu Jeevan. In contrast, a generative model will learn the underlying distribution (lower dimension representation) for Martian (mean=274, std=8.71) and Human (mean=174, std=7.32). If we know the normal distribution for Martians (mean=274, std=8.71), we can produce new data by generating a random number between 0 and 1 (uniform distribution) and then querying the normal distribution of Martians to get a value: say, 275 cm. Using the underlying distribution, we can generate new Martians and humans, or a new interbreed species (humars). We have infinite ways to generate data because we can manipulate the underlying distribution of data. We can also use this model for classifying Martians and humans, just like the discriminative model. For a concrete understanding of generative versus discriminative models, please check the article "Generative and Discriminative Text Classification with Recurrent Neural Networks" by Yogatama, et al. Examples of discriminative models include logistic regression and support vector machines (SVNs), while examples of generative models include hidden Markov models and naive Bayes classifiers. Suppose, we want train a discriminative model called "m-dis" and a generative model called "m-gen-partial" to find the difference between a dog and a cat. The discriminative model will have a softmax layer as the final layer to do binary classification. Except for the input layer and the softmax layer, all the other layers (the hidden layers) try to learn a representation of the input (cat or dog?) that can reduce the loss at the final layer. The hidden layer may learn a rule like, "if the eyes are blue and the image has brown stripes, it is a cat, otherwise it is a dog," ignoring other important features like the shape of the body, height, etc. In contrast, the generative model is trained to learn a lower-dimension representation (distribution) that can represent the input image of cat or dog. The final layer is not a softmax layer for classification. The hidden layer can learn about the general features of a cat or dog (shape, color, height, etc.). Moreover, the data set needs no labeling, as we are training only to extract features to represent the input data. We can then tweak the generative model to classify an animal by adding a softmax classifier at the end and by training it with few labeled examples of cats and dogs. We can also generate new data by adding a decoder network to the model. Adding a decoder network is not trivial, and we have explained this in the "Designing the GAN network" section. Grab the Jupyter Notebook, with conda install jupyter notebook. Generative adversarial network is a neural network model based on a zero-sum game from game theory. 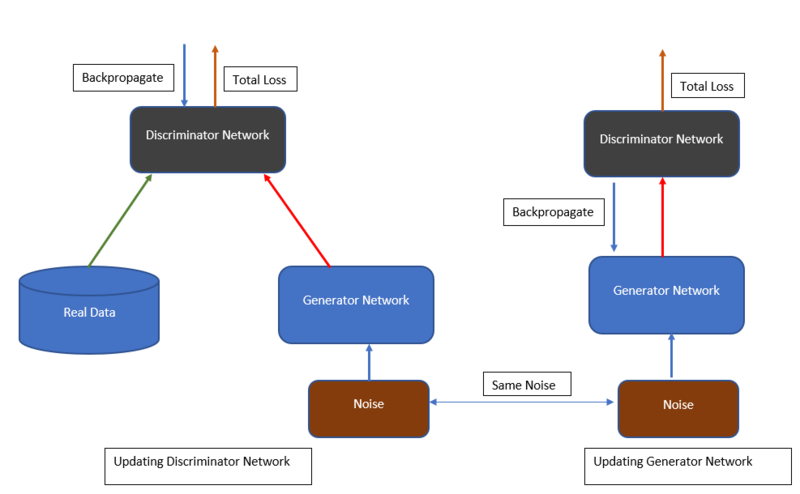 The application typically consists of two different neural networks called discriminator and generator, where each network tries to outperform the other. Let's consider an example to understand a GAN network. 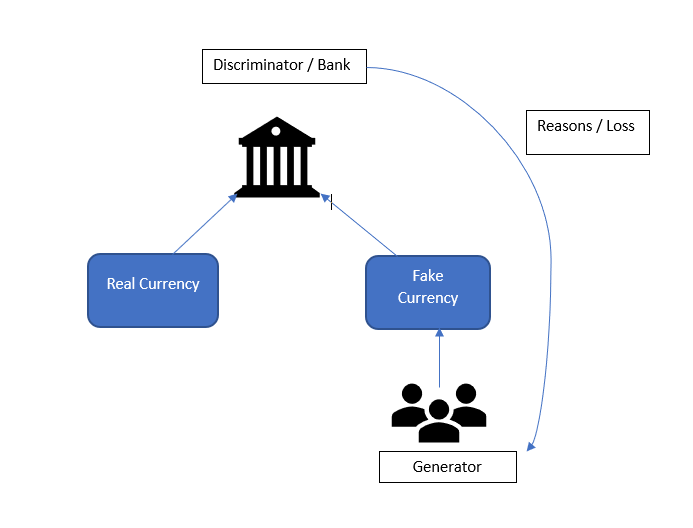 Let's assume there is a bank (discriminator) that detects whether a given currency is real or fake using machine learning. A fraudster (generator) builds a machine learning model to counterfeit fake currency notes by looking at the real currency notes. The counterfeiter deposits the fake notes in the bank and the bank tries to identify which currencies deposited there are fake (see Figure 3). Figure 3. Generative adversarial network. Image by Manu Jeevan. If the bank tells the fraudster why it classified these notes as fake, he can improve his model based on those reasons. After multiple iterations, the bank cannot tell the difference between the "real" and "fake" currency. This is the idea behind GANs. So, now let's implement a simple GAN network to generate new anime images. I encourage you to download the notebook. You are welcome to adjust the hyperparameters and experiment with different approaches to the neural network architecture. This tutorial uses the Anime-faces data set, which contains over 100,000 anime images collected from the internet. We also need to normalize the pixel value of each image to [-1 to 1] and reshape each image from (width X height X channels) to (channels X width X height), because the latter format is what MxNet expects. The transform function does the job of reshaping the input image into the required shape expected by the MxNet model. The getImageList function reads the images from the training_folder and returns the images as a list, which is then transformed into an MxNet array. We now need to design the two separate networks, the discriminator and the generator. The generator takes a random vector of shape (batchsize X N), where N is an integer, and converts it to an image of shape (batchsize X channels X width X height). The generator uses transpose convolutions to upscale the input vectors. This is very similar to how a decoder unit in an autoencoder maps a lower-dimension vector into a higher-dimensional vector representation. You can choose to design your own generator network; the only the thing you need to be careful about is the input and the output shapes. The input to the generator network should be of low dimension (we use 1x150, latent_z_size) and output should be the expected number of channels (3 for color images), width, and height (3 x width x height). Here's the snippet of a generator network. Our discriminator is a binary image classification network that maps the image of shape (batchsize X channels X width x height) into a lower-dimension vector of shape (batchsize X 1). Again, you can use any model that does binary classification with reasonable accuracy. The training of a GAN network is not straightforward, but it is simple. Figure 4 illustrates the training process. Figure 4. GAN training. Image by Manu Jeevan. The real images are given a label of 1, and the fake images are given a label of 0. A real image is now passed to the discriminator to determine whether it is real or fake, and the loss associated with the prediction is calculated as errD_real. In the next step, a random noise random_z is passed to the generator network to produce a random image. This image is then passed to the discriminator to classify it as real (1) or fake (0), thereby creating a loss, errD_fake. This errD_fake is high if the discriminator wrongly classifies the fake image (label 0) as a true image (label 1). This errD_fake is back propagated to train the discriminator to classify the fake image as a fake image (label 0). This helps the discriminator improve its accuracy. The total error is back propagated to tune the weights of the discriminator. The random noise (random_z) vector used for training the discriminator is used again to generate a fake image. We then pass the fake image to the discriminator network to obtain the classification output, and the loss is calculated. The loss is high if the fake image generated (label = 0) is not similar to the real image (label 1)—i.e., if the generator is not able to produce a fake image that can trick the discriminator to classify it as a real image (label =1). The loss is then used to fine-tune the generator network. The model weights are available here. You can download the model parameters and load it using the model.load_params function. We can use the generator network to create new fake images by providing 150 random dimensions as an input to the network (see Figure 5). Figure 5. GAN generated images. Image by Manu Jeevan. Although the images generated look similar to the input data set, they are fuzzy. There are several other GAN networks that you can experiment with and achieve amazing results. Generative models open up new opportunities for deep learning. This article has explored some of the famous generative models for image data. 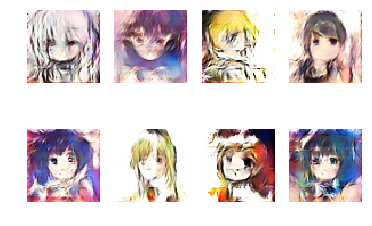 We learned about GAN models, which combine discriminative and generative models, and used one to generate new images very close to the input data (anime characters).